The 2018 Chevrolet Volt achieves a number of milestones without the usual hyperbole that sometimes surrounds lofty manufacturer claims. Its all-electric range of 53 miles is real, more than double that of the Toyota Prius Prime and Ford C-Max Energi. A $7,500 federal tax credit helps ease the Volts $34,000 starting price. Great power and efficiency with smooth acceleration and a comfortable ride. 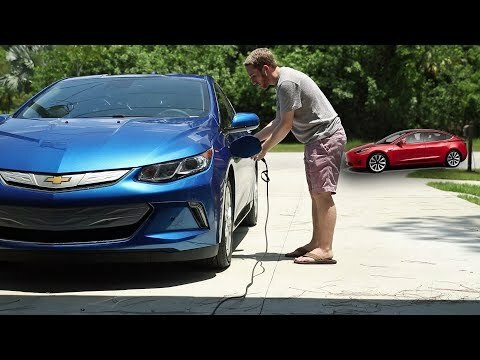 The Volt is very responsive and easy to drive. As the car is driven by electric motors all the time - even on gas, you always get smooth, consistent acceleration. When on gas, the engine drives the #2 motor/generator to make electricity to power the #1 motor. Engine on/off transitions are very smooth and only someone who really knows the car or is carefully watching for them will notice. The all electric range depends on your driving style and road conditions but is typically about 54 miles. The 2018 Volt charging rate is slow at 3.8KW on a 240V charger (16A). I typically drive between 800 - 1,000 miles between fill-ups. The gas tank holds 8 gallons. The cabin is well designed and comfortable. There are a few improvements that could be added, some of which are scheduled for the 2019. The car should have power seats at this price point. The car has a collision alert (optional package) that displays red LEDs up on the dash. It would be very easy for GM to add a full HUD with little impact on power use, weight, or cost of construction. The 2018 Volt has wireless charging in the center console for any phone capable of wireless charging. This is a great feature, but an inconvenient location. The 2019 will move this to forward of the gear shift. The adaptive cruise control is amazing - but you must always remember you are in charge of the car. Adaptive cruise is really good, but not perfect. Lane keep assist is a nice feature but I think it should be more aggressive at centering you in the lane. It will "nudge" the wheel back toward the middle of your lane but I feel that it can easily let you leave your lane. I do go back to the fact that you, not the car, are the one driving, this is just a tool to help reduce the chance of an accident. The sound system with Bose speakers is amazing. I have not yet dared to take the volume to 50%. The bass is powerful, the treble is clear, the sounds are full and rich throughout the spectrum. Sound is designed around the driver so balance and fade are not normally as good for the passengers, but you can adjust the system. Chevy volt, only an ac seat away from 5 stars. What I like most about my 2018 Chevy volt is the battery mileage. The car has performed well for me over the past year with zero issues. I wish the volt had more power, at least 100 ev miles, and ac & electric seats. Most days I average about 52-55 ev miles and while that gets me where I need to go, some days it is not enough. Also, while the volt does have enough pick-up-and-go it could use more. The item I am most bummed about it not having is electric and ac seats. I was told it was because “they didn't have room” which as an engineer I knew was a pile of bs, was later proved right by the release of the 2019 volt which has electric seats, but not ac. I might would have upgraded if they had both, it is that big of deal for me. With that said, I still enjoy the car and prefer to drive it over my Ford Fusion and Chevy truck. I believe the color selection I had to choose from was adequate and a good selection. I would have like to seen a sunroof option on the 2018 model as well as a fully decked out model from the dealership. I had to install my own led charge port as it didn't come factory installed. I felt it was necessary to install because the charge port was difficult to locate at night and align all the necessary parts. A stage 2 charger would have also been nice. It is a good choice for anyone who has concerns and cares about air pollution. I just love the car. It handles well, gets very good gas mileage, is a hybrid so that I can charge it with an electric vehicle charger and I wish it were all electric, but being a hybrid vehicle has a tremendous advantage. So essentially, there's very few things I can say that are negative. Electric cars will become much more popular when there is more availability of free public stations near libraries, in shopping malls, near the local grocery market, the theatre, etc.